For such a very short story, around the 50 to 60 page mark, this has been very hard for me to write a review. Perhaps because it is a deceptively simple story. First let me say that this is my first venture into reading Russian literature, and therefore, the formidable Leo Tolstoy of War and Peace renown. I must say that I felt a great deal of trepidation at tackling a work by such a literary giant. In the end I should not have been so concerned. My translation was by Hugh Aplin and the language flowed simply and elegantly. 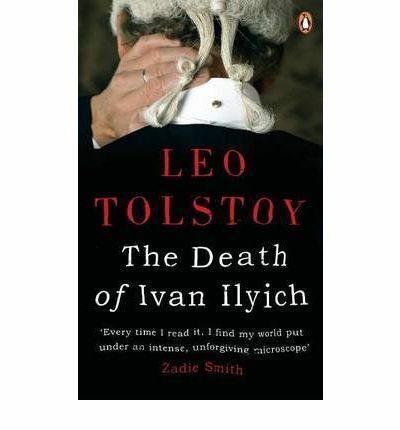 The novella begins at the end, with the death of Ivan Ilyich, and his colleagues visiting to pay their respects. We are then transported back through the years to follow Ivan from his youth, through his education in the law and on through the life experiences of gaining better positions, a wife and children and eventually a good position as a judge in the city. At the point where he gains this exulted position, he takes a grand house and sets about furnishing it to reflect his new social status. While involving himself in a hands-on way, he falls and hurts his side. Thinking nothing of this, he continues on with his life. Unfortunately for Ivan, the incident has life-changing impact. His health deteriorates and he suffers considerable pain. The doctors he consults contradict each other, but continue with an upbeat prognosis should he follow their advice. Sadly for Ivan, he declines steadily until eventually he succumbs to death at the youthful age of forty-five. There are a number of themes running throughout. The most obvious one to me was the way in which Tolstoy brings into question all of the worldly trappings and accepted “striving” for position and status amongst the upper-middle classes. It is all for naught in Ivan’s case. He may have worked his way up the hierarchy, subsuming himself to whatever the norms of that class are, but in the end his mortality will not be avoided by accumulation of things or position. His family and colleagues show this avoidance of reality in their dealings with him once he becomes ill. Death is not something they consider with regards to themselves, and are frankly glad it is happening to someone else. It makes them uncomfortable. In fact, the only person in the story who is comfortable with death is Gerasim, Ivan’s peasant servant. He is able and willing to give of himself and his kindness at the very end of Ivan’s life, when the pain is so excruciating that Ivan screams for days on end. He gives this aid freely and willingly as he hopes someone will do for him when his time comes. In the end, after much internal turmoil, Ivan comes to look back over his life and accept that his death is inevitable. In the process, he stops feeling irritated and angry with his family for their inability to see his death as imminent, and begins to pity them and their self-induced delusions. My translation was very easy reading. The story was told in enough detail to build up a picture of Ivan and his life, but no aspect seemed to be overindulged. Tolstoy truly is a master of conveying meaning with brevity. The language is not flowery or effusive, but simple and straightforward. I found that the story was told with remarkable clarity and even I could see some of the themes he was incorporating without the need for external references to guide me. Recognition of other themes would require more knowledge of the author and his particular interests and outlook than I have, but can be readily accessed in the many other online reviews of his work. If a near 1500 pages of War and Peace is too intimidating, then it is well worth reading this deceptively simple work. I can highly recommend this as an entry point to Tolstoy.